The book project I dreamed up and oversaw this year came to life in November, with the first launch in Berlin comprising of a MicroCaberat. I'm very proud of it, lucky to have worked with such great talent! Buy the book and get more info here. 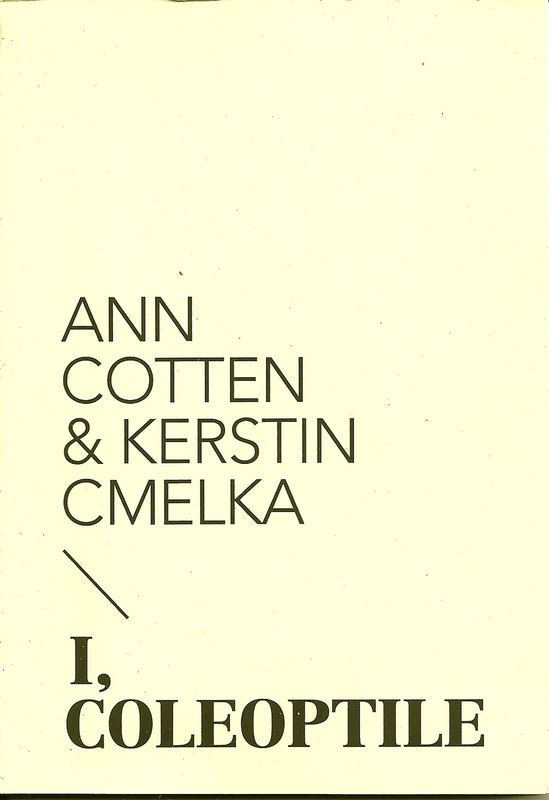 I, Coleoptile is the first full-length book in English by acclaimed Austrian poet Ann Cotten. A poet celebrated for her inventive, challenging work in the German language, often cited as one of the best poets in the language today, this collection marks an exciting chance for a wider European audience to enter the space of Cotten’s erudite, playful poetry. It also sees a unique collaboration with the visual artist Kerstin Cmelka, making the book at once a stimulating dialogue between two artists in full control of their art and a beautiful book of ekphrasis. BDP has always been interested in these things: introducing the work of young, critically acclaimed writers into another language than the one they normally work in, as well as allowing visual-textual interaction between writers and visual artists. In this way the work is given space in an environment that can see it as considered avantgarde work: new, combative, unfamiliar, rigourous. I, Coleoptile follows the unfurling of a series of lines of Cotten and Cmelka’s work: the unfurling of the personal in the world of an unruly, second language, the experience of travel (part of the book was realised on a residency trip to Ireland in July, 2010), the travails of Enzo, one of the book’s many ‘sprouts’, and the investigation into hooliganism and abrasion through Cmelka’s re-shooting of video stills from Vladimir Mayakovsky’s only foray into film, The Young Woman and the Hooligan. The result is a tightly woven book of poetry and image, with a unique design realisation with FUK Laboratories from Berlin that gives the chance to enjoy some of Europe’s boldest, most original poetry and contemporary art. 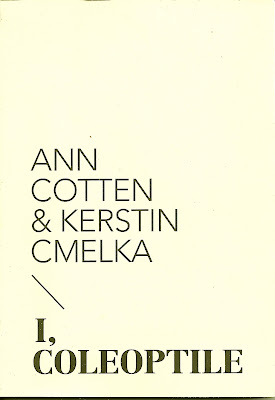 Ann Cotten has publications include Florida-Räume (2010), Fremdwörterbuchsonette (2006) both with Suhrkamp Verlag. She has also published a book on concrete poetry Nach der Welt: Die Listen der Konkreten Poesie und ihre Folgen (Klever Verlag) in 2008. Kerstin Cmelka most recently she has taken part in Gestures - Performance and Sound Art at the Museum of Contemporary Art, Roskilde, Denmark (2010), Scorpio's Garden in the Temporäre Kunsthalle Berlin (2010) and the Gegenwelten-Filmfestival at the Künstlerhaus in Vienna.